On Wednesday’s "Good Morning America," co-host Robin Roberts, for the second day in a row, intimated that Clarence Thomas was guilty of sexually harassing Anita Hill. Interviewing Anucha Brown-Sanders about her successful harassment lawsuit against New York Knicks coach Isiah Thomas, Roberts gratuitously segued, "Yesterday, sitting where you are right now, Anita Hill, who was here to talk about what happened 16 years ago when she was brought before the Judiciary Committee, with Clarence Thomas being a nominee for the Supreme Court..." Roberts then asked Browne-Sanders, "Do you think your decision in your court case can have a similar impact?" Implicit in this question is the idea that Hill’s claims against the now-Supreme Court justice are true. Would Roberts use Clinton-accuser Paula Jones as a similar comparison to a modern case? On Tuesday’s GMA, the ABC host employed the same tactic in the interview with Anita Hill. Roberts sympathetically questioned, "Is it better now in the workplace for women?" Again, this leaves the assumption that for things to be "better," Thomas must have been guilty of making them worse for Hill. Following ABC’s lead and sixteen years of puffball precedent, a CNN camera crew with an unidentified reporter caught up with Anita Hill in New York City and threw softball questions at her. The interview aired on Tuesday’s "The Situation Room," at the bottom of the 5 pm Eastern hour. Is "The View’s" Joy Behar comparing Supreme Court Justice Clarence Thomas to O.J. Simpson? With a comment on the October 2 edition of the women’s chat show, it sounded like it. The "Hot Topic" discussion involved Justice Thomas’ new book "My Grandfather’s Son" and Anita Hill’s sexual harassment allegations. On Tuesday’s "Good Morning America," ABC host Robin Roberts sympathetically interviewed Anita Hill and asserted that her 1991 testimony in front of the Senate resulted in the law professor enduring "withering scrutiny from the press." Roberts also pointedly noted that Hill "passed a polygraph test. Clarence Thomas refused to take one. You passed one." An ABC graphic defiantly observed, "Anita Hill: ‘I Stand by my Testimony’"
The segment on GMA stood in stark contrast to the mostly positive and fair coverage Thomas received on Monday’s "Good Morning America" and "Nightline." (The Supreme Court justice has been promoting his new autobiography.) Reporter Jan Crawford Greenburg allowed Thomas to tell his side of the story and attack accusers, such as when Greenburg noted, "Thomas says he faced more racism in the confirmation fight than he did as a child in the segregated south." As the MRC’s Tim Graham wrote on Monday, Hill, who accused then Supreme Court nominee Thomas of sexual harassment, hardly suffered through "withering scrutiny" from many media outlets, especially in the wake of the hearings. In early 1992, "60 Minutes" reporter Ed Bradley gingerly asked Hill, "When someone looks at you and sees Anita Hill, what do you want that to mean?" 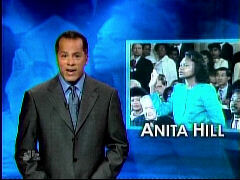 Those people who thought Steve Kroft’s interview with Clarence Thomas on Sunday’s 60 Minutes was not tough enough should remember that Anita Hill received a very gentle 60 Minutes treatment on February 2, 1992. Ed Bradley drew out the disclosure that she was a Democrat, but went on with a set of gooey questions about whether she has Eleanor Roosevelt quotes on her office wall. CBS made no attempt to investigate Hill's unproven claims. The purpose was public relations. Bradley began: "We haven't heard much from Anita Hill since those hearings, but she's heard a lot from people around the country: more than 30,000 letters of support, many from women who shared their stories with her and let her know she's not alone." Bradley began by asking Hill: "You've been described as someone who is conservative in your positions. Is that a fair description of you?" In a clever, roundabout answer that any politician would envy, Hill agreed: "I think I am conservative to a number of people because I do have a religious background. I do go to church. CBS's 60 Minutes got the first interview with Clarence Thomas on the occasion of the release of his memoir and ABC's Good Morning America is in line for the morning show exclusive interview with him to air multiple days this week, thus leaving NBC News out of the mix. So, the losing network decided to resurrect Anita Hill. Anchor Lester Holt teased Sunday's NBC Nightly News: “Her story. Justice Clarence Thomas speaks out, and tonight so does the woman who nearly derailed his confirmation.